Dual Group One winner Limato cantered on Tuesday at a media visit to trainer Henry Candy's Kingston Warren stables, north of Lambourn, organised by Newbury Racecourse ahead of the £350,000 G1 Al Shaqab Lockinge Stakes this Saturday. Limato, who runs in the familiar colours of owner Paul Jacobs, has not raced since posting an easy three and a half-length victory in the G2 Challenge Stakes over seven furlongs at Newmarket in October. 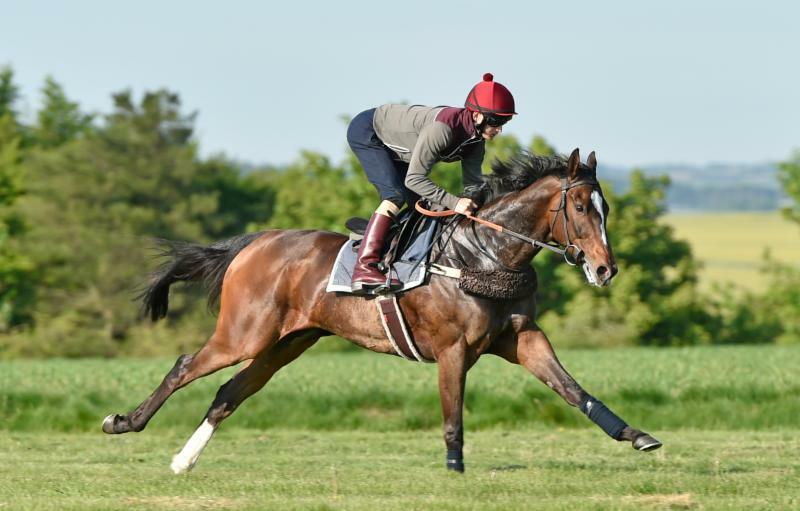 The six-year-old's CV also includes two impressive G1 victories during the 2016 campaign, in the six-furlong July Cup at Newmarket and the Prix de la Foret over seven furlongs at Chantilly, France. Following this morning's exercise under big-race jockey Harry Bentley, Candy said: "It is hard to judge when then horse is working on his own a long way away from you. The relevant thing is what Harry says and he is very happy with him, so I'm happy. "Limato's preparation [since turn of the year] has been remarkably good really considering how the weather has been. 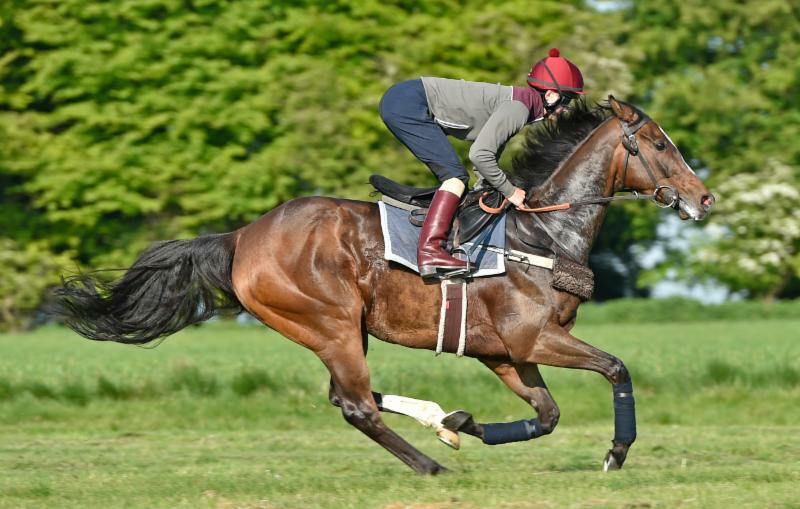 "Mr Jacobs and I decided that we would like to try a mile again, with mainly me pushing it, and once we decided that, the Al Shaqab Lockinge Stakes is the obvious place to start. "He has done an awful lot of work on the carpet gallop, which is far too easy for getting a horse fit, but it just keeps them ticking over. "We have had odd days when it has been OK to work on Kingston Warren bottom [grass], which is where he did his first canter this morning. We picked bits of ground there and he has been able to do that every week or 10 days. "I think he is probably fit enough - he has had three or four mornings up where we finished this morning. "I had to take the precaution of starting him in plenty of time. I think if you had left it five or six weeks to start work, he would have been up against it, but he has plenty of work under his belt." Limato will be tackling a mile for the third time in his career at Newbury on Saturday. He finished fourth behind Belardo in the 2016 renewal of the Al Shaqab Lockinge Stakes and sixth in that year's Breeders' Cup Mile at Santa Anita, USA. Candy commented: "It is still guess work really. I am pretty confident that he will get a mile, but you would be an idiot if you said you were 100 per cent confident. "Santa Anita was a nightmare because the horse boiled over saddling and in the pre-parade ring. They went off at record-breaking pace and we told Harry to be handy. Had we known how fast they were going to go, we would not have done. That race told us nothing. "The previous time he ran in the Lockinge, the ground was on the sticky side and our horses were not firing at that stage. I thought the horse ran on pretty well to be fourth and I am pretty optimistic he will get a mile, although you can never be sure until you try when all factors are right. "It would open up a lot of doors for the horse [if he gets the mile]. It is tricky one because a lot of horses tend to get quicker as they get older, especially sprint handicappers who seem to be quicker when they're eight. "I just get the feeling this horse is not quite as sharp as he was when he was running in Nunthorpes and things like that, but maybe if you wound him up, he could possibly go and do it again. "The object of having the sprint entries is that if gives us an option with the ground, given Newbury has been soft at this stage before with no prospect of drying out. If that was the case this year and York was dry, he would have gone for the Duke Of York Stakes, which may sound like complete nonsense to most people. But I think the horse is capable of switching codes if needed. "Fran [Berry] has been riding him a fair bit when Harry has not been able to come down and Fran said it is hard to believe that this horse nearly won a Nunthorpe and won a July Cup. He said he really rides like a middle distance horse now, though I think the horse is so intelligent he just adapts himself to what you ask him to do. "He is not quite as ferocious as he used to be, but you still have to be pretty careful. He is ultra-competitive and I think that is what it is all about. He just wants to get on with things all the time and does not like people fiddling around with him. He is his own man, but he is a proper racehorse and wants to do what he is bred to do. "He boiled over in America and has been pretty close to it a couple of other times. When he won the Foret and the July Cup, it was touch and go whether you could get a saddle on him. Hopefully, he will be a little bit quieter on Saturday! "The ground at Newbury should be perfect. I think Richard [Osgood] is aiming for the slightly easier side of good to firm on Friday, so on Saturday it should be proper fast ground." The opposition on Saturday is set to be headed by Addeybb (William Haggas), who is two from two so far this year following impressive two and a three-quarter length victories in the valuable Lincoln Handicap at Doncaster in March and the G2 Sandown Mile on April 27. The Al Shaqab Lockinge Stakes is the second race in the mile division of the QIPCO British Champions Series. Candy continued: "I think this year's Lockinge is very similar to the one he ran in a couple of years ago. "I think it is winnable if everything goes right, although we don't really know how good Addeybb is going to be. "He is the one you fear because he is improving whereas the others are all fairly well known. He has been winning with cut in the ground and perhaps the ground will work in our favour." Regarding future plans, Candy added: "I haven't really thought further ahead than Saturday and we will take one step at a time, but I think we would certainly consider travelling him again at some point. "He travelled really well to the Breeders' Cup and trained really well over there. He was in great form, it was just in the last hour before the race that things went wrong. "Dubai was a complete nightmare. I was trying to train him here in January and February on heavy ground, which was never really going to work. OK we took him to Kempton a time or two and kidded ourselves that he was OK, but I just looked at him when I put the saddle on in Dubai and thought 'mistake', and he ran like it. "You could blame the ground to a degree, but I don't think he would have won whatever the ground was. I kept kidding myself the whole way through that we're OK, but it is not his time of the year. He loves sunshine on hard ground. "I thought it was quite incredible that he came back from Dubai and ran as well as he did in his first two races. He wasn't far behind Harry Angel in the July Cup and was perhaps a bit unlucky. "Then I think it got to him a mid-season little bit. Whether he was a bit quiet at Goodwood I don't know, but the ground was atrocious and, like so many things, in hindsight it was a mistake running him. We walked the track and talked ourselves into running, but it was a bad idea. "After that, it was very frustrating because he just never got the ground. He kept having entries and eventually the Challenge Stakes was just OK [ground-wise] and he was back to his best. 2017 was a frustrating year in many ways and Dubai may have just taken the edge off him, but it was mainly the weather." Harry Bentley has ridden Limato in nine of his last 10 races, including his latest victory in the G2 Challenge Stakes at Newmarket in October, plus his two G1 wins in 2016 and holds high hopes for a big performance from the six-year-old on Saturday. Bentley said this morning: "We are very happy with Limato. He is in really good form and that was his last bit of serious work - we're very pleased with how it went. "Henry has been very happy with how he's been throughout the winter. I have been coming into the yard for the last five weeks and each time I've been very happy with how he has worked, so he is definitely fit going into Saturday's race." Regarding questions mark surrounding his stamina for the mile trip, Bentley continued: "I tend to think that the trip will be fine for him. He has run over a mile in America (sixth, Breeders' Cup Mile, Santa Anita, November 5, 2016) and here in the Lockinge when fourth in the race in 2016 and he certainly didn't run badly over the mile at Newbury in that race. "He is older and I think the mile is definitely on his radar. He is very relaxed in his races and there is no chance of him over-racing. "I think with age, horses tend to be able to stay that little bit further, so that's why I think he will be alright with the mile this time. "The ground is very important to him, possibly the most important thing of all. He likes quick ground and we have made that very clear in the past. "Any sort of ease in the ground is unfavourable, but conditions are looking great and he should really like the ground on Saturday." Limato is the 7/2 joint-favourite along with the Aidan O'Brien-trained Rhododendron with Paddy Power for Saturday's G1 event, but, like Candy, Bentley is fearful of the progressive Addeybb (5/1), who steps up to G1 company for the first time. Bentley explained: "Addeybb is probably the dark horse in the race. He has been progressive this season by winning the Lincoln at Doncaster and then a G2 at Sandown. "He is now stepping up to G1 level and is rapidly rising through the ranks. He looks a very good horse and he is certainly one of the horses to watch in the race. "Limato has been a brilliant horse for me. He's put me on the map in these big G1 races which are not easy to be involved in. "He usually comes out and puts in a great performance. He is a straightforward ride and on his day, he is a seriously good horse and very hard to beat." Candy is also planning to run Sovereign Duke (9st 2lb) in Saturday's £70,000 Al Zubarah London Gold Cup Handicap over 10 furlongs. Recent winners of the three-year-old contest include future G1 performers Al Kazeem (2011), Cannock Chase (2014) and Defoe (2017). Sovereign Duke, a son of Jukebox Jury, won a mile maiden at Kempton Park in January and was not disgraced when fifth, beaten just under six lengths, in the G3 Classic Trial at Sandown Park on April 27. Candy said: "Sovereign Duke ran well at Sandown in what looked quite a good race. We were very happy with that. "Saturday will be a bit sharp for him as the race we are aiming him for is the Queen's Vase. If there was a mile and five race somewhere before Ascot, he would have gone there, but there isn't. "I think the Queen's Vase distance [1m 6f] is what he wants. There is plenty of stamina in the pedigree. I don't think he has quite got the class for the St Leger, but we will bear it in mind." The forecast for the week ahead is for dry conditions, with sunny spells. There will be watering as necessary to maintain conditions.